All type of Gynecology products like Umbilical Cord Clamp, Cytobrush / Endocervical Brush, Infant Mucus Extractor, Umbilical Catheter etc. For meeting the need of healthcare industry, we offer this standard quality Umbilical Cord Clamp that is widely demanded for use in nursing homes, clinics and hospitals. The offered clamp is used after the birth of baby, if there is a chance of jaundice. As per the set industry standards, this is manufactured under the vigilance of our seasoned experts by making use of quality checked materials. Furthermore, this is offered at very cost effective prices in the markets. 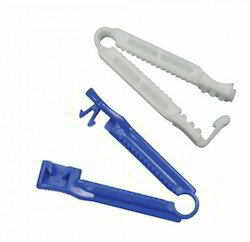 Umbilical Cord Clamp is used for clamping the umbilical cord of newly born baby. Manufactured from non toxic, medical grade polymer. Permanent locking system protect against the reopening of the clamp. Finger grip is provided to facilitate easy holding and locking of the clamp. Catheter clamp is also available for clamping the catheters. Keep pace with the changing trends of the market, we have emerged as a distinguished organization of high quality Infant Mucus Extractor. This is precisely manufactured by making use of quality approved materials under the guidance of our skilled experts. Aspiration of secretion from oropharynx in newly born babies, this is widely utilized at hospitals, and nursing homes. Furthermore, our valued clients can avail this at very pocket friendly prices. Infant Mucus Extractor is used for Aspiration of secretion from oropharynx in newly born babies. Transparent Chamber for visual examination of the content. Catheter is provided with round open tip for non traumatic intubation. 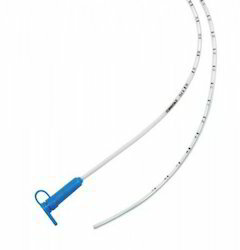 Proximal end of suction tube is provided with Funnel shape connector for easy connection to the suction equipment. Also available with Filter and without Filter Models. Blessed with modern infrastructure and latest technology, we are offering our clients supreme quality Umbilical Catheter. It is available in gradation of specifications as per client's specific demands. Mainly used in hospitals, and clinics, this is used to access the umbilical vessels of pre-matured infants or in newly born babies. This is precisely manufactured by making use of good quality materials at our well-structured production unit. Further, clients can avail this from us at market leading prices. Umbilical Catheter is used to access the umbilical vessels of pre-matured infants or newly born babies. Manufactured from non toxic, medical grade PVC. Smooth round tip for non traumatic insertion and well finished surface facilitates smooth passage of catheter in the vein. Radio opaque line provided throughout the tube for checking the position of the catheter radiologically. Marking is provided at every cm to ascertain depth of insertion. 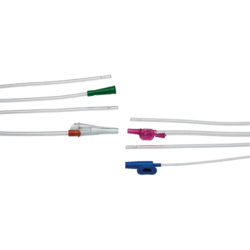 Proximal end of catheter is provided with Luer Female connecter for easy connection to the I.V. Therapy equipment. Suction Catheters® are suitable for removal of secretion from mouth, trachea and bronchial tubes. Manufactured from non-toxic non-irritant medical grade PVC. Frozen surface tubing for smooth intubation. Yankaur Suction Set is suitable for convenient removal of secretion, blood and debris etc per operatively. Complete set is provided with Yankaur Suction Tip mounted on two meter long ribbed tube provided with Universal connector at both ends. Universal connectors are moulded from soft PVC, so as to accommodate the Suction tip on one end and all type of connectors of suction apparatus at the other end.